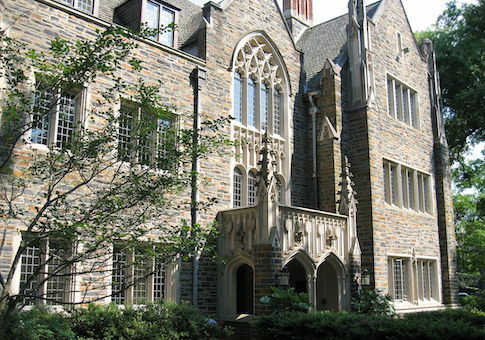 Duke University's administration and student newspaper, the Chronicle, are facing charges of anti-Semitism after editors on the student newspaper penned an editorial smearing a prominent pro-Israel lobbying group and defending anti-Jewish comments recently made by freshman representative Ilhan Omar (D., Minn.). In a recent unsigned editorial, "AIPAC and the blockade on critiquing Israel," students at the Chronicle defended Omar's recent declaration that powerful Jewish interests control politics, an age-old anti-Semitic trope that was condemned by Democratic and Republican leaders. The op-ed, which set off a firestorm on campus, particularly among pro-Israel and Jewish students, went on to repeat anti-Semitic canards about Jewish control in politics and allege that the American Israel Public Affairs Committee, or AIPAC, wields outsized control over lawmakers. Both the university leadership and the Chronicle editorial staff declined Washington Free Beacon requests for comment on the matter, leaving the op-ed and its smears to publicly stand. This has riled pro-Israel leaders and those who work to combat anti-Semitism across the globe. The editorial decries "Israel's murderous policies in Palestine" and inaccurately alleges that "AIPAC has ensured that Israel remains one of the top recipients of U.S. foreign aid without having to answer for the 295 Palestinians killed and 29,000 injured by Israeli forces in 2018." AIPAC does not donate money to any politicians and functions solely as an advocacy group for pro-Israel causes, which enjoy the support of the majority of Americans and lawmakers on Capitol Hill. The piece goes on to criticize what it describes as "Zionist settler colonialism," making the argument that being anti-Zionist is not akin to being anti-Semitic. The article was "written by The Chronicle's Editorial Board, which is made up of student members from across the University and is independent of the editorial staff," according to the Chronicle‘s website, which includes a list of these students on its masthead. Keith Lawrence, a university spokesman, would not comment on the article and its factually inaccurate claims about Jewish control of politics. "We are going to decline comment," Lawrence said. Bre Bradham, an editor at the Chronicle, declined to make any members of the editorial board available for comment about the piece, telling the Free Beacon, "Thanks for reaching out, but we're not interested in commenting." Rabbi Abraham Cooper, associate dean at the Simon Wiesenthal Center, an organization that works to combat anti-Semitism, expressed outrage over the editorial, telling the Free Beacon it reflects anti-Semitic canards long used to foster hatred of Jewish individuals. "My first reaction when I read it was to take a double take," Cooper said. "I thought it was from Tehran University, not Duke University." "All of the talking points demonize Israel," Cooper said, adding that the editorial makes false claims about AIPAC's function. "They actually repeated the same slander that congresswoman Omar stated initially." "The Zionist lobby is in their minds, like sort of the boogeyman," Cooper said. "It is a tragedy" because college campuses were once a place where students "challenge [their] assumptions about life and were open to all sorts of ideas." However, "this is an editorial in lockstep with those who hate Israel and who hate Israel supporters." When informed that Duke University leadership and students declined to discuss the editorial on the record, Cooper expressed surprise. "Shame on Duke University for making believe it has nothing to do with this," he said. This entry was posted in Issues and tagged Anti-Semitism, College Campuses, Ilhan Omar, Israel, North Carolina. Bookmark the permalink.